In the last couple of weeks, I was fortunate enough to take a two-day masterclass from NBSL (based in the North-East of England) in ‘Developing A Video for Digital Marketing’ Masterclass in taught by Pascal Fintoni. The two classes took place a week apart with a LOT of homework to do in between. I was unwell between the two sessions so it was a scramble to get everything completed. One deceptively simple task was to make a short video composed of still frames (photos) edited into a sequence, to show how to make a cup of tea. Pascal recommended the ‘Quik’ app, which is now on my phone and although making this first video was decidedly not quick for me, I’m sure that the next one will be easier. So here is my masterclass video which shows you exactly what goes on each time I run down the stairs from my studio on the landing to make a pot of tea. This is ‘proper tea’ made in a pot, though it has to be said that purists might choose to add the milk after the tea is poured into the cup! The grainy, early-cinema effects are all supplied by the app. We were advised not to ‘run before we could walk’ which was good advice, but which came rather late for me, as one of the first things I did when I started Amanda Jane Textiles was to make a video on YouTube on ‘How to thread a Bernina Sewing Machine’. My friend Lyndsey filmed me on her phone and edited the film for me. It has had (at the time of writing) been viewed 32,982 times! And oh, how I wish now that I had tidied up the room just a little bit more ahead of time… lesson learned. You can see it here. At the same time, she filmed a series of ‘how-to’ videos for me, to show how to construct a patchwork block to go into my ‘Animals’ quilt, you can see the first video here. 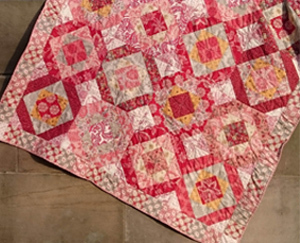 The free pattern for this single-bed quilt is here. Later, I put together a class on Skillshare about making a first quilt and learned (slowly) to do some editing using the VideoPad programme. I tried the free version first and felt that I could learn to use it. The hardest part of all for me was the introduction to the course which I recorded many, many times over. This skill was something we practised on the course and it definitely becomes easier with repeated practice. We were given some good basic advice too about utilising a tripod and about having an extension lead for your phone (if you film on your phone) and about using a microphone. I do plan to make another video course, because I love teaching basics – because it means that someone can be introduced to an occupation that they can enjoy for years. That’s very motivating. With my newly-honed skills from my masterclass, I’m thinking about an introduction to knitting (right- AND left-handed) and maybe embroidery… What do you think? If you would like to read this blog every week, look for the words ‘Follow this blog by email’ and enter your email address. The blog posts will arrive each Monday in your in-box. Your email will never be shared with anyone else. 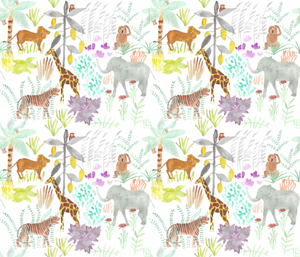 This is my ‘Music’ fabric design, which you can find here.